Who Really Likes Youth Defence? 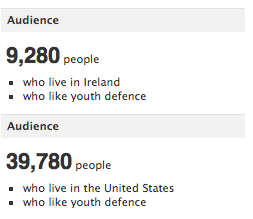 In response to Niamh Ní Bhriain’s claim in The Irish Times today that Youth Defence has “been inundated with support from the public, while [our] Facebook page has grown to some 58,000 supporters.” However, only 9,280 of their followers are resident in Ireland. Above data pulled from Facebook ad-buying interface. Posted in Misc and tagged Youth Defence at 2:23 pm on July 4, 2012 by Broadsheet.